This entry was posted in Conferences and Lectures, Events, Uncategorized and tagged Age of Revolution, Haiti, revolution, rights, slavery on February 13, 2014 by mghachem. I am thrilled and delighted that my old friends at the John Carter Brown Library in Providence, Rhode Island (a favorite research location) have remounted a new version of the 2004 exhibition that I curated in connection with the JCB’s bicentennial conference on the Haitian Revolution. The exhibition is open now through the end of April 2014 and is accompanied by a wonderful digital version that you can access here. The new version of the exhibition is part of a collaboration between the JCB and the New York Historical Society. If you have not yet seen the scintillating essays in the NYHS’s Revolution! volume that came out a few years ago (edited by Rabinowitz, Dubois, and Bender), by all means hasten to read them. Thanks so much to Susan Danforth, the JCB’s George S. Parker Curator of Maps and Prints, for all she did to make this new edition of the exhibition possible, and to Leslie Tobias Olsen for work on the website version. 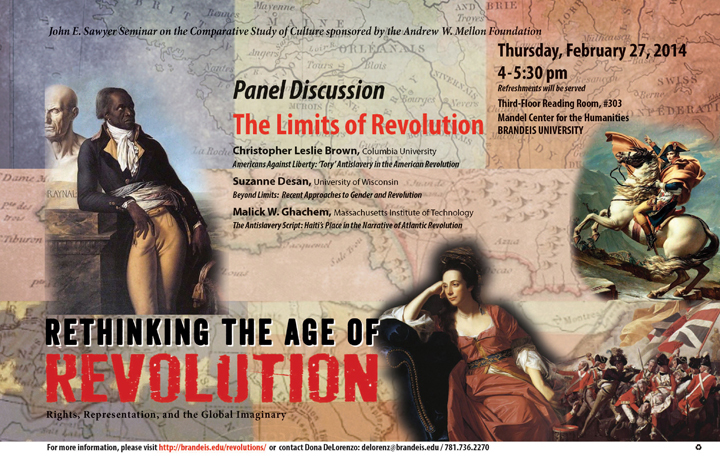 Looking forward to marking the occasion with a lecture on Haiti at the JCB on March 8 and, even before then, at a Feb. 21 panel that is part of the “Curators on International Slavery” series at Brown on Feb. 20-21, 2014. This entry was posted in Conferences and Lectures, Events, Exhibitions, Uncategorized and tagged Age of Revolution, exhibition, Haiti, Haitian Revolution, slavery on February 12, 2014 by mghachem.